Hello. I am Paige. A 15 year old homeschooled teen. Follower of Jesus. Daughter. Sister. Blogger. And owner of Pink Lemonade. I love my family and friends more than anything. I love crafting , shopping, cooking, thrifting, and sewing! My creative journey began in March of 2010. Like many, I was looking for a way to make money without getting a "real job". I come from a family of small business owners, so working hard is a part of daily life! My sister introduced me to Etsy, an amazing online marketplace for crafters. Having never seen anything like this before, I fell in love! After poking around the internet a bit, I discovered the wonderful "handmade community" of bloggers and shop owners! It was incredible to see other thrifty and crafty people like me! I was hooked... :) With God's help my business and blog have grown far beyond what I ever imagined. I am so thankful for the many exciting opportunities that I have been given, and the incredible people that I have met along the way. coupon code: takeheart for 30% off! leave a comment here to be entered to win. Yay for a fabulous giveaway!! I am a follower of Take Heart! Luv it! Follower of Pink Lemonade...very impressive, lady! And I am already a follower here! Wow, Thats a great accomplishment! i follow you, of course, of course. So cute, I have always loved the stuff over at Pink Lemonade! I too am also doing a small giveaway if you want to check it out- I would appreciate it! I also follow pink lemonade! I am a follower of "Take Heart"
And I'm now a follower of Pink Lemonade! Count me in! Thanks for the opportunity! I LOVE Pink Lemonade! Yay! Such a cute shop. And I just started following Pink Lemonade! This shop is so cute! Thanks for the giveaway! Love Love Love all the pretty rosette colors!! I'm a follower of Take Heart via GFC! I'm a follower of Pink Lemonade via GFC! i love that blue necklace. what a great giveaway! yay for a fab giveaway!! Follower of TAKE HEART! :D LOVE! I am a follower of take heart! 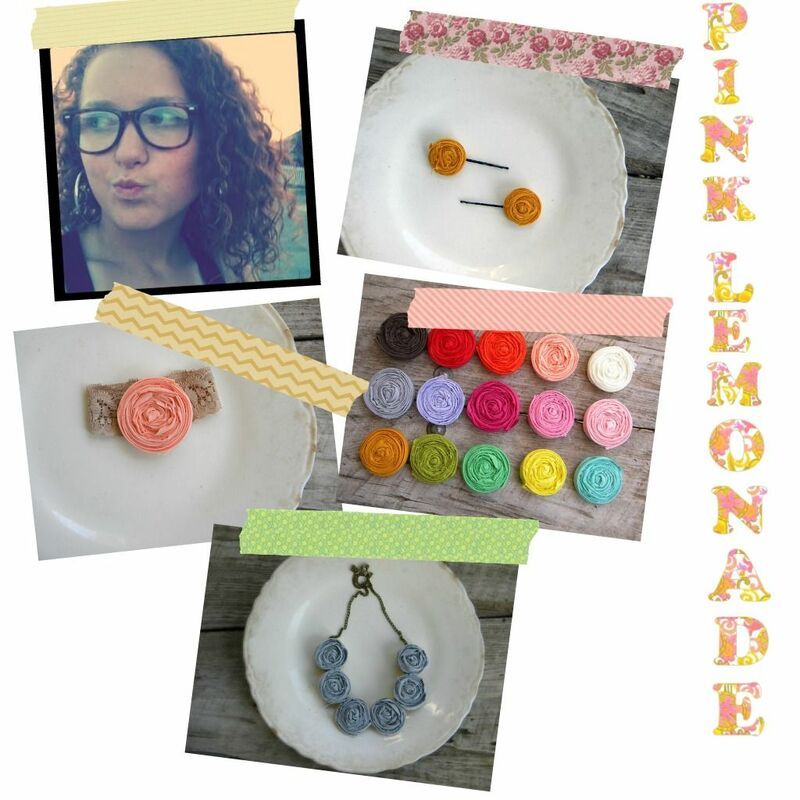 I follow the pink lemonade blog! I am a Take Heart follower. And now a follower of Pink Lemonade! EEEE! I hope I win!!! Very neat giveaway! I follow take heart on my google reader. not sure if that counts! Adorable little rosettes! Would LOVE to win! Fun! Thanks for introducing us to a new artist! and i already follow take heart as well. How wonderful for this young entrepreneur, wishing you the best for many years to come! I follow Take Heart! Thanks for the chance. I'm seriously obsessed with those necklaces!!! And of course I follow you!!! YAY! I love pink lemonade. LOVE Pink Lemonade! I've been seeing her stuff pop up all over the place this week... I think it's a sign! ;) Love your blog too, Danielle. Your life blesses me! she's 15? that's so rad. i follow your lovely blog miss danielle! I follow Pink Lemonade! I didn't realize how young Paige is- that is soo awesome!!! Way to go girl! Also, the stuff you make ROCKS!! Love her stuff! Fingers crossed. That necklace that goes to your adoption fund is my favorite. Ooo yay! love pink lemonade! Thanks for hosting the giveaway! i like to craft. :) yeah.